This is part 2 in a series exploring Gerald Rau's book Mapping the Origins Debate. For other posts in the series, click a number: 1, 3, 4, 5, 6, 7, 8. In this post we'll overview Rau's six origins models. They fall into two groups: evolutionary models (of which there are four) and creationary models (of which there are two). We'll note points of agreement and disagreement, due to multiple factors that will become more evident as we proceed through the series. If the origins debate is to be productive, a key issue has to do with agreeing on what is meant by key terms. One such term is "evolution," which is used in various ways, sometimes referring to a philosophy as much as a process. That philosophy is naturalism, "the conviction that everything can be explained by natural causes" alone, an idea closely related to materialism, "the idea that there is no reality apart from the material world" (p42). There is no supernatural (the atheistic position promoted by Richard Dawkins and Daniel Dennett) or, there is nothing that can be known about the supernatural (the agnostic position promoted by Stephen Jay Gould). Therefore, evidence from the natural world (empirical evidence) is the only basis for knowledge. Anything else is either pure falsehood (the atheistic view) or mere speculation that cannot be confirmed by evidence in nature (the agnostic position). The supernatural exists but whatever that force is, it has no plan for the universe and thus does not intervene in its development. Only natural forces have brought about the universe's development since its supernatural beginning, thus naturalistic explanations are sufficient to explain that development. According to PE, "God had a definite plan in mind, which was set into motion at the moment of creation." Proponents of this view "typically employ an interpretation of the early chapters of Genesis in which the creation story is treated as an ancient genre wherein the emphasis is placed on the actor rather than the action, on God as Creator rather than on the process of creation" (p45). PE acknowledges that "God has the capacity to intervene in nature but does not need to do so because of the perfection of the original creation" (p45). Proponents of this veiws believe that a "fully gifted creation" was able to bring forth through natural, evolutionary processes, all that we see in the universe today, including humankind. PE has gained prominence as a form of "theistic evolution" through the work of Francis Collins and his BioLogos Foundation. Scientifically, PE is essentially equivalent to NE and NTE, "since God does not regularly intervene in the development of life or species, and therefore natural processes are thought to be sufficient to explain the evidence. The difference lies in the fact that PE asserts the mechanisms for change were built into creation and established for the specific purpose of bringing about God's plan of creating a sentient being who could worship him (p46). God created the universe with a plan and created it perfectly to bring that plan to fruition without further intervention. The natural laws and processes created by God are sufficient to account for all natural events since the moment of creation. Therefore, science can always find natural explanations for natural phenomena. DE and PE have a shared perspective on interpreting Genesis, though "proponents of DE are more likely to view Adam and Eve as single individuals who are the progenitors of the entire human race. [DE] asserts that God not only brought the universe into being but continues to act in it, not only in the lives of individuals in response to prayer but also in creative events, to bring about his plans. In many cases this does not involve superseding natural law as much as direction of low probability events, hence the name of the model" (pp46-47). DE views science and religion as "interacting domains of knowledge," therefore "at least some questions [concerning the origin and development of the universe] are best addressed using evidence from both domains" (p47). The evidence that is found in Scripture has to do with the existence of a deity who intervenes from time to time in miraculous ways. The evidence for all other aspects of development is to be found through science, in natural mechanisms. Proponents of DE include Michael Behe, the well-known advocate of "Intelligent Design" (ID)--a philosophy that seeks to harmonize the ideas of creation and evolution. For more about ID, see The Discovery Institute website. God has a predetermined purpose for the world, and the Bible shows that he intervenes in the natural world as necessary to advance that purpose. Noting the miracles recorded in the Bible where God intervenes occasionally in redemptive history, it's reasonable to think that he has (and is) intervening in natural history. This would be true particularly with respect to low-probability events that seem to be directed toward a particular goal. Rau also presents two "creationary" origins models: old-earth creation (OEC) and young-earth creation (YEC). Both assert that "empirical evidence of direct creative acts" can be found in the natural world (the book of nature). They also assert that "the Bible explains not only the purpose of creation but also something about its mechanism" (p48). As we explore the creationary models we should remember that two of the evolutionary models (PE and DE) share with OEC and YEC the belief that the Bible and the book of nature are both important revelations of God and his creative activity. Moreover, these revelations, when properly interpreted, will not conflict. But why then the differences between PE, DE, OEC and YEC? The answer has largely to do with how the Bible (particularly the first chapters of Genesis) is interpreted. Those who reply, "well, I don't interpret the Bible, I take it literally" are ducking this issue, for the very act of reading Scripture is an interpretive act as the reader assigns meaning to the words (for more about this issue, click here to read an earlier Surprising God post). OEC agrees with DE "that science and religion are interacting domains of knowledge" though OEC asserts that the Genesis account has "explicit scientific value" (p49). Over the years, several OEC models have been advanced, including progressive creation, day-age creation and various "gap theories." The most well-known defender of OEC today is Hugh Ross and his Reasons to Believe organization. God chooses to reveal himself through the Bible and creation, both clearly disclosing his existence, identity and creative activity. In harmonizing the evidence of science with the testimony of Scripture, we must find the most straightforward interpretations. That includes harmonizing the biblical statement that God created in six days with the empirical evidence that the universe and earth appear to be billions of years old. Advocates of YEC refer to it as "scientific creation." 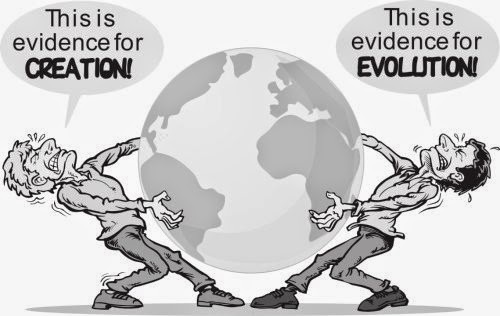 Its detractors tend to refer to it (rather mockingly) as "creationism." According to YEC, "where evidence from another domain, particularly natural science, appears to conflict with what the Bible says, it is the latter that comes out on top" (p50). This idea is based on a particular way of interpreting Scripture, the first chapters of Genesis in particular. This approach to the subject, of course, creates strong animosity between YEC and NE and thus the current "creation vs. evolution" debate, which is mostly a debate between atheistic or agnostic proponents of NE and conservative Christian proponents of YEC. In short, YEC and NE are polar opposites, "the former claiming that the Bible overrules scientific evidence, the latter that scientific evidence disproves the Bible." Christian YEC advocates believe that the Bible teaches that God created the world and everything in it in six literal 24-hour days about six (some say ten) thousand years ago. For them, any other idea is tantamount to "reinterpreting the Word of God on the basis of the fallible theories of sinful people" (p51, quoting Ken Ham, perhaps the most well-known proponent of YEC through his Answers in Genesis organization with its creation museum in Ohio). Each word of the Bible, as the inerrant Word of God, must be understood in accord with its normal, common meaning, unless there is clear evidence to the contrary from within the Bible itself. When the Bible says that God created everything in six days, it means six sequential 24-hour days. When it says he created each kind of animal, or that he created man (male and female), it means each was created separately and fully formed. That being so, all scientific evidence must be interpreted in a way that is consistent with these presuppositions which are grounded in a particular interpretation of Scripture. Next time we'll look at what each model has to say concerning the origin of the universe. Thanks Bill for this additional information. I'll have more to say about the PE model in future posts in this series. Is the resolution of this difficult puzzle complicated by our presuppositions that, on the one hand God is and on the other that God isn't in evidence? When we take that a step further, we find that not only can't we answer the how, we haven't understood the why. Divorcing ourselves from the secularist, why did Jehovah Adonai create this complex existence to begin with? At this point the arguments begin to get complicated because the Biblical pattern and scriptural references are overlooked. Instead we rely on reason. Consequently, we propose that God created simply to share His love with creation. But in the process, we refuse to even contemplate the significance of that assertion. What does the Bible say? Did the Almighty plan creation? Was His plan merely to love? Did God have something else in mind? And if He did, how does that change our perspective on the scientific evidence for creation? How does the incarnation of the second person of the Trinity figure in God's pre-creation plan? Did God initially plan to engage Himself in a perfect world? When did God realize there was a need for the incarnation? What would the incarnation achieve? An examination of the scriptural evidence reveals some significant details rarely mentioned as the reason for the incarnation. 2 Timothy 1:9 tells us that the Plan of Redemption preceded the creation of time. At that time, God gave birth to the concept of the incarnation, as expressed in Hebrews 10:5. But to what end? Well, according to Daniel 9:24, Romans 8, and 1st Corinthians 15, Christ came to destroy evil. He came to eradicate all forms of corruption. But isn't it interesting that while Christ came to destroy the works of the devil, the devil didn't even exist when God planned the incarnation? In fact, even time didn't exist. So, if God created this universe, this temporal (as defined by time) existence, with a very specific purpose (namely the incarnation and the destruction of evil), how would that figure into an evolutionary model, the cause or development of which would have to be accidental? See Kindle ebooks for "Purpose Driven Creation" by Carlos Ramirez for more details.